I have a porch that consists of 2 slabs, each about 8 foot by 12 foot, with one being approximately 7-8 inches higher. I would like a wooden porch, the same size but one level. What is the best way to construct this? I also plan on it having a peaked roof. Without actually seeing your existing porch and surrounding area, I can only offer suggestions as informational only. You will want to consult with a local contractor who will be able to better assess the situation on site. That said, you have a couple of options. One is to place "sleepers" (or treated joists) over the concrete slabs (adjust the heights to account for the differences in the slabs to make them equal in height). They are called sleepers because they rest on the concrete. 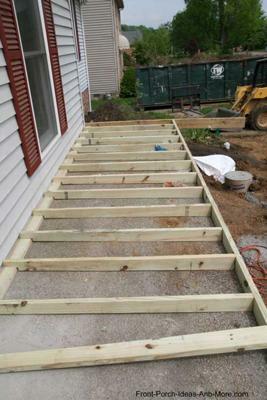 You would then cover the sleepers with either deck boards or a high quality exterior plywood. You will have to ensure the top surface is level and sloped away from your home (see photo above). This can require framing skills as each sleeper may have to be custom cut to ensure uniformity across the porch. The more level your existing slabs, the easier it will be to cut the sleepers. Then you could install something like interlocking deck tiles over both surfaces. 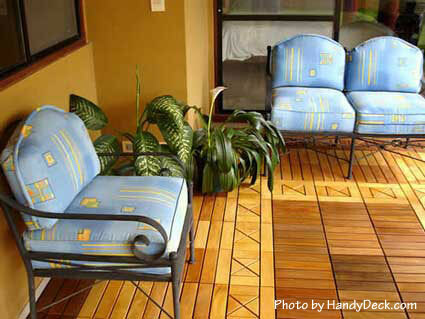 Interlocking deck tiles can be used over almost any surface. If not opting for the interlocking deck tiles, you'll need to place sleepers on both surfaces. You could only do this if there is sufficient space between the existing slab and your door (otherwise the flooring would prevent the door from opening). You would then place your wood porch flooring over the sleepers. Another option of course, is to remove the concrete entirely and rebuild the porch from the ground up. In either case you will also have to plan for the columns (if there aren't any now) for the gable roof. The existing slabs may or may not be able to support the columns (check with your local building codes department). Again, I recommend you contact a local contractor who will be able to visually inspect and recommend the best approach for your specific situation. We hope this helps you know how to build a porch over concrete.